Forays into the production of surface cleaners. Luxor group has recently launched surface cleaner called Nano Clean which is present in 12 variants. The product was launched 100 days back. Luxor group has set up a manufacturing unit in Haridwar and has produced around one million units so far. Nano Clean has already started showing its presence in 15,000 retail outlets in 27 cities across India. It has been the first product to use nanotechnology in the world. Luxor Group is planning an investment of around Rs 100 Crore and expects a business of Rs 500 crore in the next five years. Company is also planning to launch a similar product for mobile and electronic goods in August 2012. Speaking about the USP of the product, group’s chairman and president DK Jain explained “ Nano clean, cleans as well as protects the surface, it forms a film of width three nm. One nanometer can be physically imagined as hair strand’s sixty thousandth part. The product claims to protect the surface for four weeks before it shall be used again”. The company is targeting to bring it to as many as 50,000 retail outlets pan India before first April 2013. Luxor Group which is known for its writing instruments business, has been present in retail, hospitality and real estate as well. When asked about the reason to choose cleaning industry for the expansion Jain said, ” we have chosen this as we are the first one in the world to bring in nanotechnology in this industry, we are the inventors and that’s why we have decided to come into this industry”. 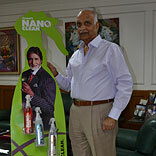 Recently Luxor Nano clean has signed Parker’s face Amitabh Bachchan to promote the product. Very soon, TVC on the product will be released. The company is planning to involve 20 per cent of the revenue on its marketing and advertising.